Hiking is one of those rare activities that allows you to fully explore a place at your own pace, taking time to truly appreciate your surroundings, proving that the journey often rivals the destination. 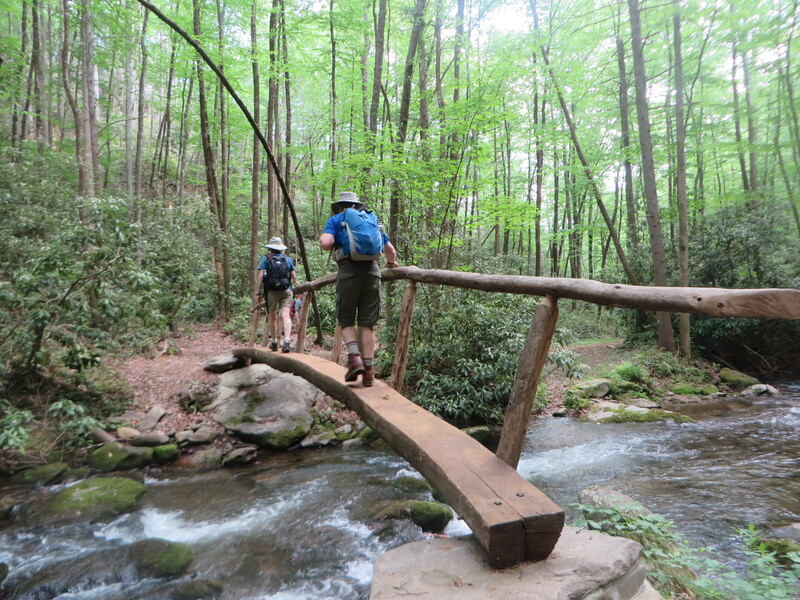 On Wildland Trekking’s 5-Day Smoky Mountains Hiking Experience, you’ll have the opportunity to get up close and personal with one of the most naturally and culturally significant mountain landscapes in the country. The Great Smoky Mountains National Park is both a World Heritage and Biosphere Reserve Site, renowned for its diversity of plant and animal life, as well as for the beauty of its ancient mountains. It’s also an icon of Southern Appalachian culture spanning back to the late 18th century. And the best way to experience this majestic national treasure is to do what the original settlers and explorers did – hit the trails. At over 500,000 acres, with an elevation range of more than 5,000 feet from the valley to the highest peaks, the park’s behemoth size is difficult to fathom. Ridge upon ridge of forest straddles the border between North Carolina and Tennessee. It’s a hiker’s paradise with more than 800 miles of maintained trails and nature walks where casual hikers or experienced trekkers can enjoy the most gentle or rugged terrain imaginable in the eastern U.S. The scenery is magical with cascading waterfalls, bucolic valleys, verdant forests and sweeping vistas everywhere, along with abundant wildlife and wildflowers. And if you’re wondering about the park’s namesake, “Smoky,” it refers to the natural fog that often hangs low over the park’s forests, a result of the collective exhalation of organic compounds by the forests’ vegetation. That explains why from a distance the mountains appear as if they have large blue smoke plumes emanating from them. 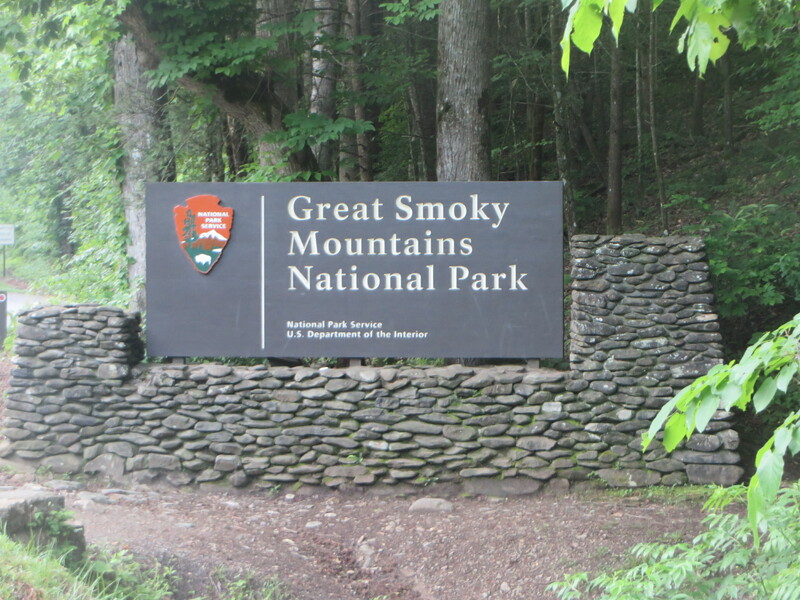 The movement to establish the Great Smoky Mountains National Park actually began back in the early 1920s. Its creation, however, was far more complex than that of its predecessors, such as Yellowstone and Yosemite. The Park Commission had to negotiate the purchase of thousands of small farms and remove entire communities, while convincing logging firms to sell lucrative lumber rights. It also had to deal with two state legislatures, which at times were not in agreement with spending taxpayer money on park efforts. The park officially opened in 1934 with President Franklin D. Roosevelt presiding over the opening ceremony at Newfound Gap. Today, the Great Smoky Mountains National Park is the most visited park in the country with over nine million visitors annually. You will start and end your Wildland Trekking Smoky Mountains trip in Asheville, often known as the “Paris of the South” or “Land of the Sky.” This iconic town boasts historic landmarks, cultural attractions, a dynamic arts vibe and an innovative culinary scene. A dizzying array of craft breweries keep the beer flowing like mountain water, hence the reason for another of Asheville’s monikers – “Beer City USA.” The place is a hub of creativity that attracts artists, musicians, inventive chefs and outdoor lovers, who thrive amid the area’s natural beauty. Take the hop-on, hop-off Historic Trolley Tour for an informative and entertaining overview of the city. Knowledgeable guides will regale you with interesting facts and humorous tales of the town and the colorful characters who helped put it on the map. Check out the River Arts District, where you can stroll along streets dotted with galleries and studios. 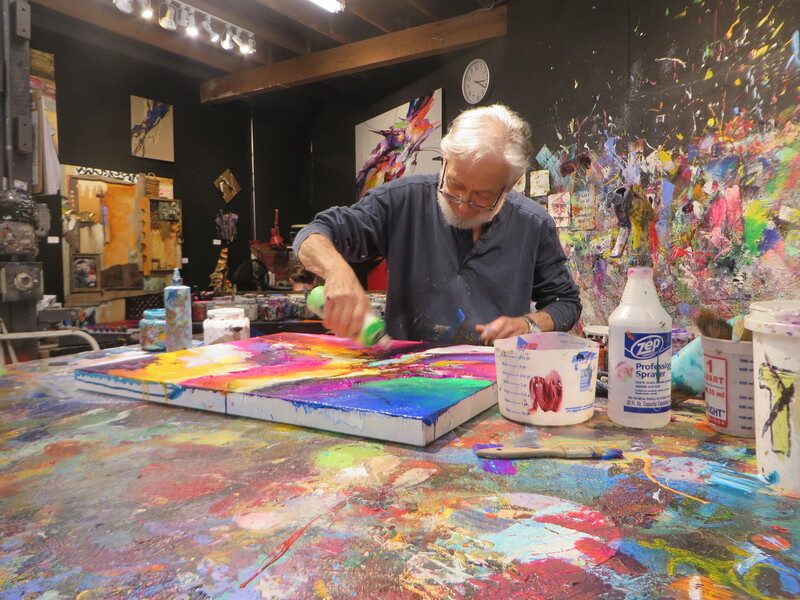 Stop in at Jonas Gerard Fine Art and watch Gerard himself at work on one of his many abstract paintings. The well-known artist is happy to chat, and you’re welcome, even encouraged, to actually touch his paintings for a unique textural experience. Head downtown to browse and window shop at the many eclectic stores, and make sure you do some people watching from one of the hip sidewalk cafés. You’ll find folks of all ages in Asheville, as it’s a very inclusive town with offerings to suit a variety of interests and tastes. 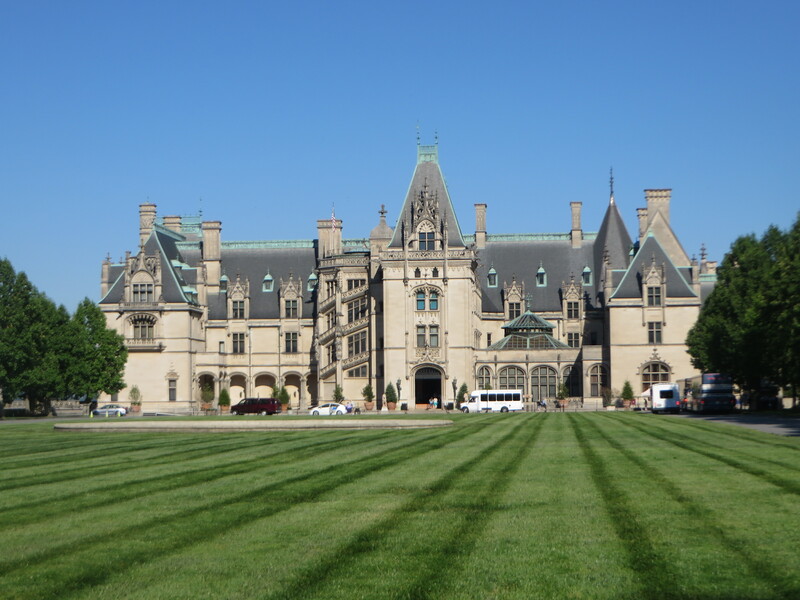 A must-see attraction, for most, however, is the Biltmore House & Gardens. With 250 rooms and four acres of floor space, it’s the country’s largest private home and the crown jewel of Asheville’s architecture. It has been called a “tour de force of America’s gilded age” and stands as testament to the enduring vision of its creator, George W. Vanderbilt. As you drive the three-mile approach road to the house, the anticipation begins to build. Know that your expectations will soon be exceeded once you lay eyes on this magnificent fairytale castle. Vanderbilt sought to build a retreat reminiscent of the grand palaces and estates of France and Britain and he succeeded on every level. Tours of the property and its extensive gardens are self-guided. Opt for the audio version to further enhance your experience. It’s worth it. You’ll travel back in time to the late 1800s and early 1900s, as you walk through opulent rooms filled with original furnishings, art and artifacts, including priceless portraits of Sargent, Renoir, Whistler and others. The library and its shelves containing 20,000 rare books is jaw-dropping. In true upstairs-downstairs fashion, your tour also includes an opportunity to see where the small army of servants lived and worked while employed at the Biltmore. Take time to explore the grounds, as they are truly remarkable. Frederick Law Olmstead, the father of American landscape architecture, created a landscaping masterpiece that includes a naturalist forest and formal gardens, as well as a productive farm. 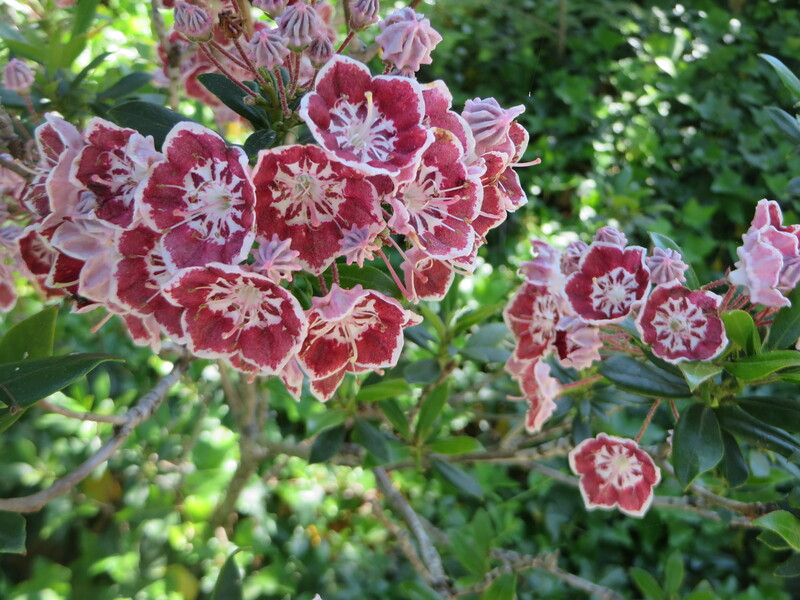 There’s a lovely Italian garden with long pools, a shrub garden, rose and azalea gardens and an English walled garden with floral pattern beds. It’s a treat for the senses as you roam the pathways and take in the dazzling colors and perfumed scents. Biltmore’s 8,000-acre estate is also home to Antler Hill Village & Winery, where you can savor and sip complimentary tastings of handcrafted wines. Nearby is an historic barn and farmyard, complete with an assortment of friendly animals for the kids to enjoy. For the active set, you can arrange to go cycling, take a Segway or guided horseback trail ride along the many paths, and even kayak, paddleboard or raft the river that runs through the property. Though you might think you’ll need to say adieu to civilization’s conveniences once you leave Asheville and begin your hiking adventure, that won’t be the case. On this particular Wildland trip, you’ll have all the creature comforts you desire. The itinerary is inn-based and ideal for those who want a hot shower and sleep in a comfortable bed after hiking upwards of eight miles a day. Personally, I don’t mind camping for a night or two, but, I’m really not a backpacker, so this style of trip greatly appealed to me. 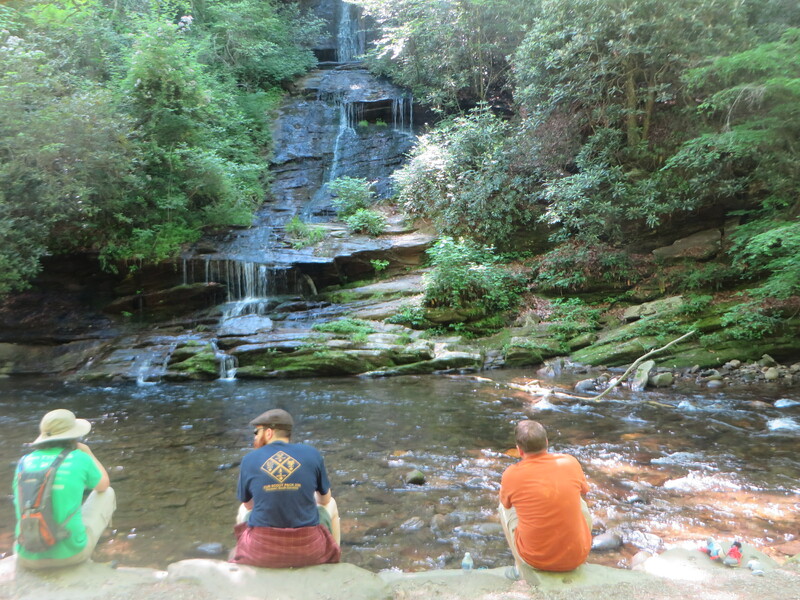 Choosing to go with Wildland Trekking was a no brainer. The previous year, I had done a Grand Canyon hiking trip with the company and had been very pleased with my experience. Hiking in a small group with a guide proved to be incredibly fun, as well as eye-opening, as I learned a lot about the geography, geology, wildlife and history of the area. I appreciated being accompanied by a highly-trained and knowledgeable individual, who also cared about my safety…and didn’t mind answering all my questions! The trip emphasizes several highlights of the Smokies, providing an intimate experience with the landscape at various areas in the park. We explored both the Tennessee and North Carolina sides with hikes to such places as Big Creek, known for spectacular Midnight Hole and Mouse Creek Falls. The former is a deep, dark green pool below a picturesque waterfall that flows between two large boulders; whereas, the latter is a 45-foot waterfall that tumbles over several tiers of moss covered rocks before crashing into the creek. 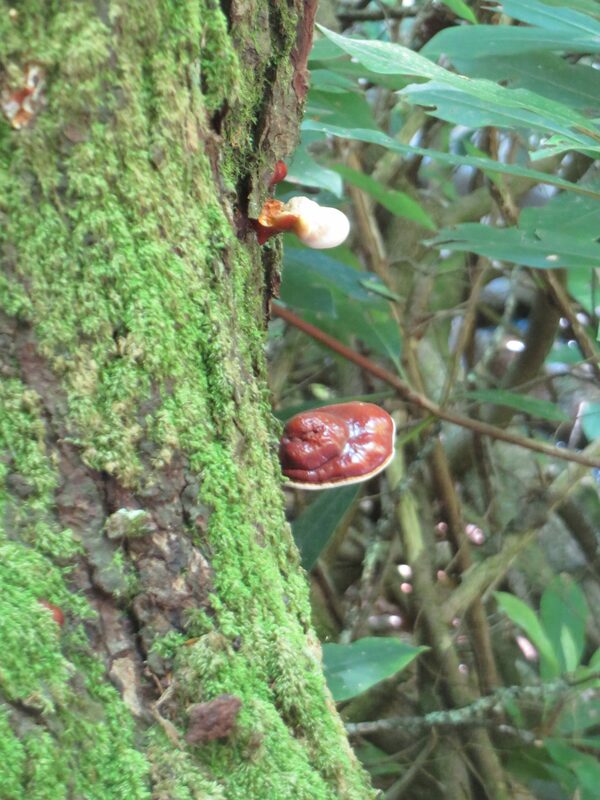 Along the trail, our guide Ian, an enthusiastic young man with an abiding respect for Mother Nature, waxed poetic about the Reishi mushroom. High in antioxidants, it reportedly has miraculous health benefits. We saw the fungi attached on trees in shelf-like fashion. Sometimes it was white; other times, red or caramel colored. Ian also pointed out plants like wood sorrel, which is edible and tastes similar to parsley, along with the infamous poison ivy and prolific mountain laurel of the Smokies. On another day, we trekked up the Middle Prong of the Little River to Lynn Camp Prong Cascades and Indian Flats Falls. 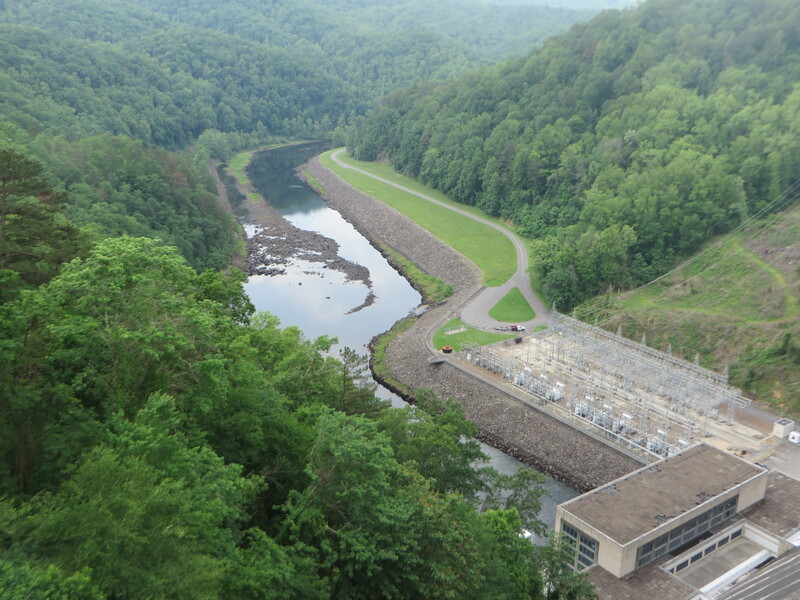 This stunning river valley is arguably home to the Smokies’ most scenic waterfall hike and along the way, you’ll get a fascinating glimpse into Smoky Mountain lumber history. Part of the trail used to be a railroad route to get supplies in and lumber out of the mountains, and you can see remnants of this railroad, as well as parts of buildings from the old community of Tremont. The trail passes numerous smaller waterfalls, all picture-pretty, and is blanketed with a host of wildflowers such as trilliums, violets and jack-in-the-pulpits. Stream sounds provide a melodious musical accompaniment. After a series of switchbacks, you’ll get the return on investment upon reaching glorious Indian Flats Falls. Dip your tired feet in the icy water or go big and opt for the full body treatment that’s guaranteed to be refreshing! A hike to Porters Creek led to a historic barn and the old headquarters for the Smoky Mountain Hiking Club. There was a small backcountry cemetery nearby with graves dating back to the 1870s; several which belonged to infants and young children. 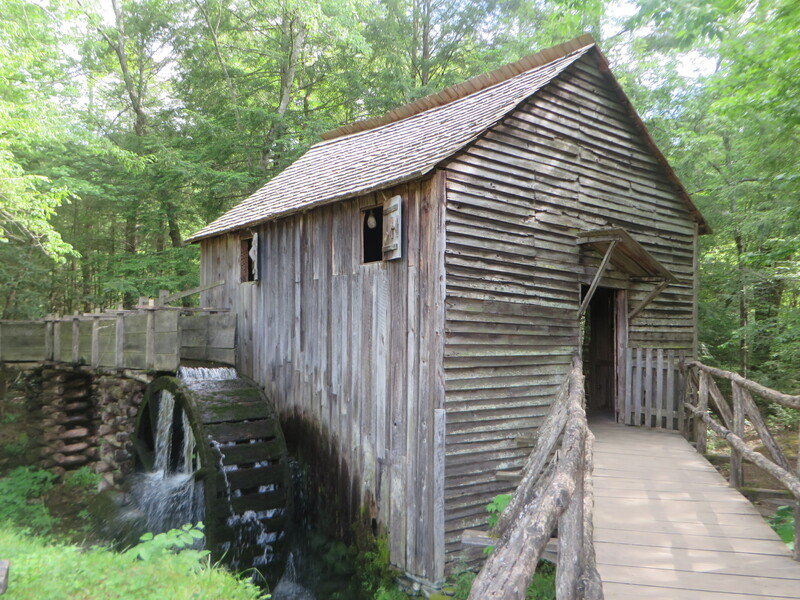 Early settler history is prevalent throughout the park, but nowhere is it most prominent than at Cades Cove, once home to a pioneer community of farmers, families and homespun industry. This broad valley surrounded by mountains is one of the most popular destinations in the Great Smokies, as it offers the widest variety of historic buildings of any area in the park. 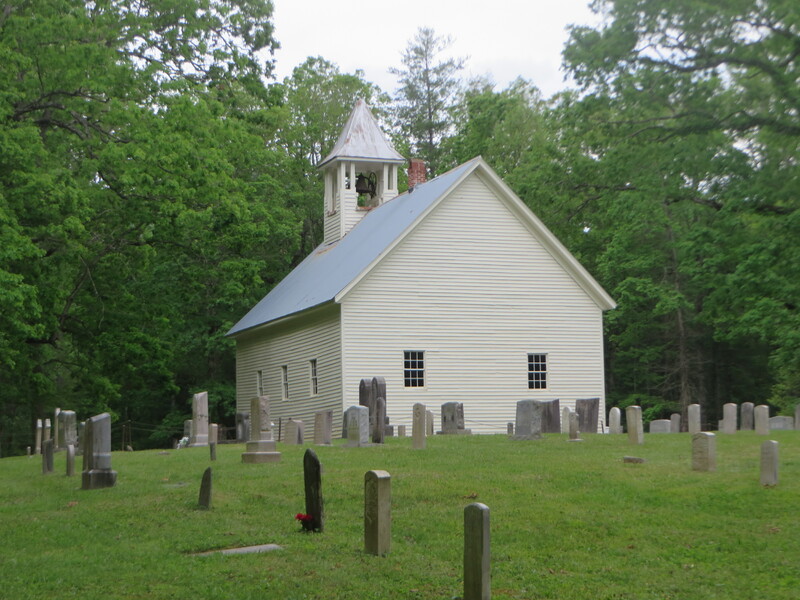 Scattered along the loop road are three churches, a working grist mill, barns, log houses and many other carefully restored 18th and 19th century structures. Look for the handprints on the ceiling of the Primitive Baptist Church. They were made by the children who held the boards in place for the men to hammer. The wood was pine and its sap made it sticky to work with; hence, the indelible record of human hands. Cades Cove is also known for having some of the best opportunities for wildlife viewing in the park. You can often spot large numbers of white-tailed deer, along with wild turkey, black bear, coyotes and other creatures in the open valley. We were fortunate to see several bears, but at a comfortable distance as to not disturb them. You can always tell there’s a bear somewhere when you see a pile up of cars on the side of the road and hordes of folks with cameras and binoculars excitedly pointing in one direction. The park is actually one of the largest protected areas in the eastern U.S. where black bears can live in wild, natural surroundings. Biologists estimate that roughly 1,500 of these creatures live in the park, a population density of approximately two bears per square mile. Visitors need to be continually reminded that bears are wild animals. They are dangerous and unpredictable, and you should not approach them or allow them to approach you. Unfortunately, there are some folks who will do anything to get that special picture, jeopardizing not only their lives, but those of the bears as well. 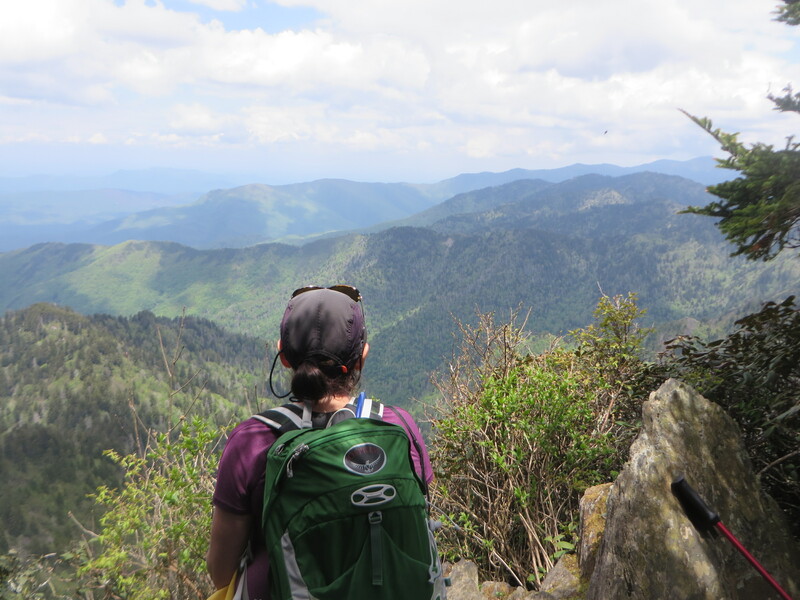 One of my favorite hikes was along the fabled Appalachian Trail (the A.T. as it is commonly called) towards Charlies Bunion, a celebrated rock formation, with fabulous views of the endless rolling ridges of the Smokies. Story has it that this bare rock pinnacle was named after mountain guide Charlie Connor’s foot affliction because it jutted out just like his bunion. The popular hike begins at historic Newfound Gap, a mountain pass located near the center of the park and situated along the border of Tennessee and North Carolina at the state line. This is the place where FDR formally dedicated the park. It’s also the site of the Rockefeller Memorial, which honors the $5 million gift from the Rockefeller Foundation to complete land acquisitions for the creation of the park. 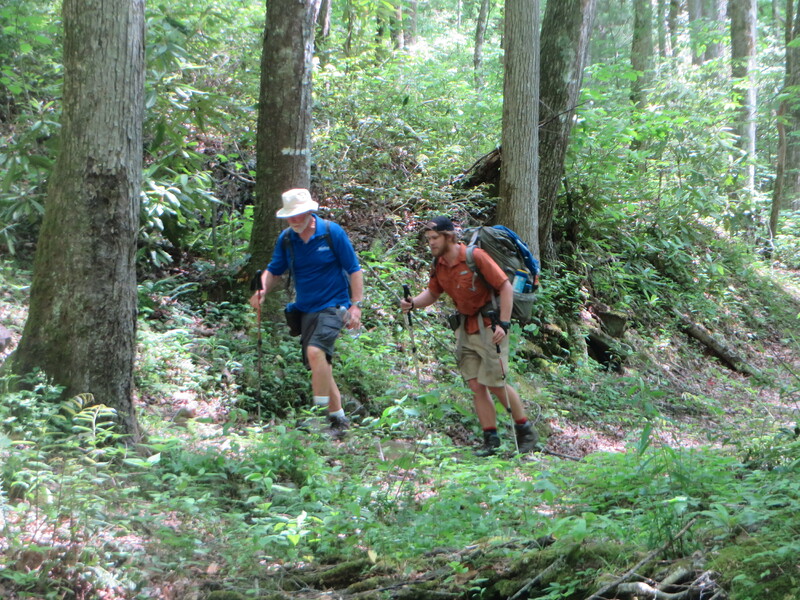 As we hiked, we came across a number of A.T. hikers, some who claimed to be thru-hikers, attempting to complete the entire 2,190 miles in five to seven months. Each year thousands set off to accomplish this massive undertaking, but the reality is that only one in four actually makes it all the way. The trail goes through fourteen states, ranging from Georgia to Maine, and is the longest hiking-only footpath in the world. It is also one of the most supported, long distance trails with over 250 back-country shelters and a range of services to assist hikers. Chatting with some of these ambitious folks gave me insight into how arduous and grueling this endeavor is and the physical and mental toll it takes on the individual. Observing the loads they carried made me glad to be toting only a day-pack! It seemed that each hike we took, we saw something different. The biodiversity of the park is staggering, from tiny plants and moss growing on a rock by the side of a trail to a huge 400 year tulip tree towering like a sentinel over the forest. The Smokies are home to as many tree species as are found in all of Europe (130 native species) and the region is considered a crown jewel of virgin old-growth eastern hardwood forest. As for the fauna, there are 66 species of mammals, over 240 species of birds, 43 species of amphibians, including the greatest variety of salamanders in the world, 60 species of fish and 40 species of reptiles. Flora and fauna have been thriving and diversifying here undisturbed for millennia due to the fact that the last Ice Age didn’t get this far south and the sea never came this far inland. To this day, researchers are continuing to discover and document new species. In between hikes, we stopped in at several of the park’s visitor centers at Sugarlands, Cades Cove and Oconaluftee. 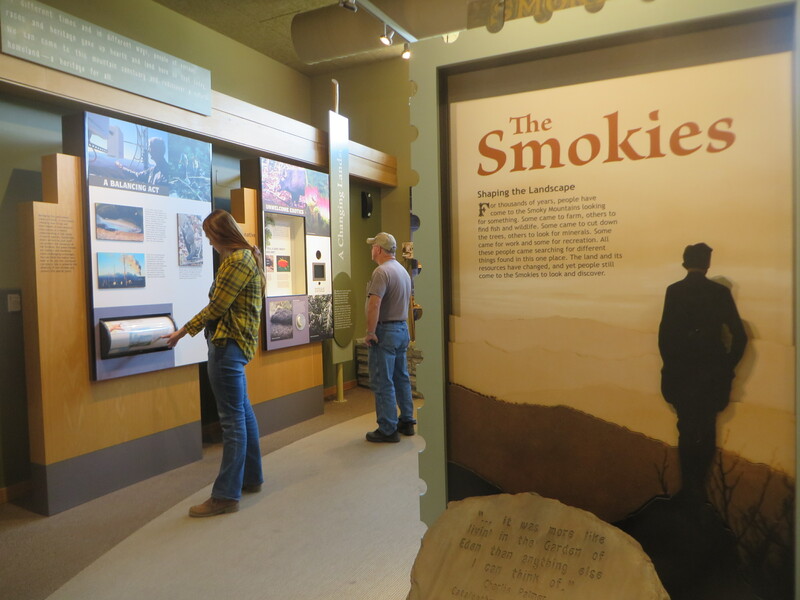 Sugarlands has a natural history museum with exhibits on the geology of the Smokies, history of people in the mountains, flora and fauna of the region and more. At Oconaluftee, in addition to displays about the development of the park and settlement time periods, there is the adjacent Mountain Farm Museum. It’s an outdoor venue with farm buildings, most dating around 1900, that were moved from their original locations throughout the park to create an open-air museum. You can explore a log farmhouse, barn, apple house, smokehouse, springhouse and working blacksmith shop to get a sense of how families may have lived one hundred years ago. After hiking each day, we would return to our charming accommodations. For the first two nights, we stayed at Dancing Bear Lodge in Townsend, Tennessee. This property offers deluxe, comfy cabins with all the amenities, including hot tubs, stone fireplaces, heavenly beds and mini kitchens stocked with house-made granola, fresh fruit, yogurt, juice and coffee –all the fixings you need for a tasty continental breakfast in the morning. 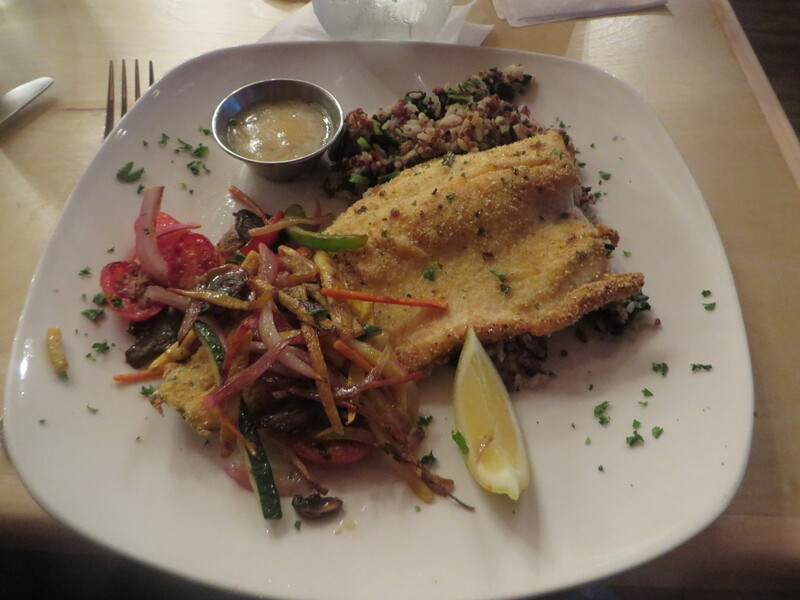 Dinner at the lodge’s Appalachian Bistro is a memorable culinary experience with dishes like Lump Crab Stuffed Trout, Truffle Potato Crusted Halibut and Cast Iron Beef Tenderloin. Dine al fresco on the patio and later, head to the rock fire pit to toast marshmallows and make your own s’mores. Our digs for the last two nights of the trip was the Everett Hotel in Bryson City, North Carolina. This luxury boutique hotel, a renovated bank building from 1908, has nine tastefully appointed guest suites, a rooftop terrace with panoramic city and mountain views, and a newly opened restaurant, the Cork & Bean Bistro, which focuses on local, sustainable and seasonal fare. Here you’ll find such delectable offerings as Carolina Mountain Trout with a cornmeal crust; Gumbo Ya Ya, a combination of chicken, Andouille sausage, brown rice and veggies; and Eggplant Involtini, sautéed eggplant stuffed with goat cheese, accompanied by roasted spaghetti squash and grilled broccolini. A hot cooked breakfast is complimentary for guests, and as hikers, we appreciated a menu of hearty entrees that included fresh made quiches, crepes, Belgian waffles and breakfast sandwiches to fuel us for the day’s trek. On the trail, Ian would prepare lunch each day. From his bulging backpack, he would pull out pots and pans, and all sorts of ingredients, and whip up a yummy spread that we attacked like piranhas. One day it was lettuce wraps with salmon; the next, an innovative corn and bean salad with tortilla chips. We enthusiastically chowed down on whatever concoction he prepared, knowing it would be tasty and satisfying. 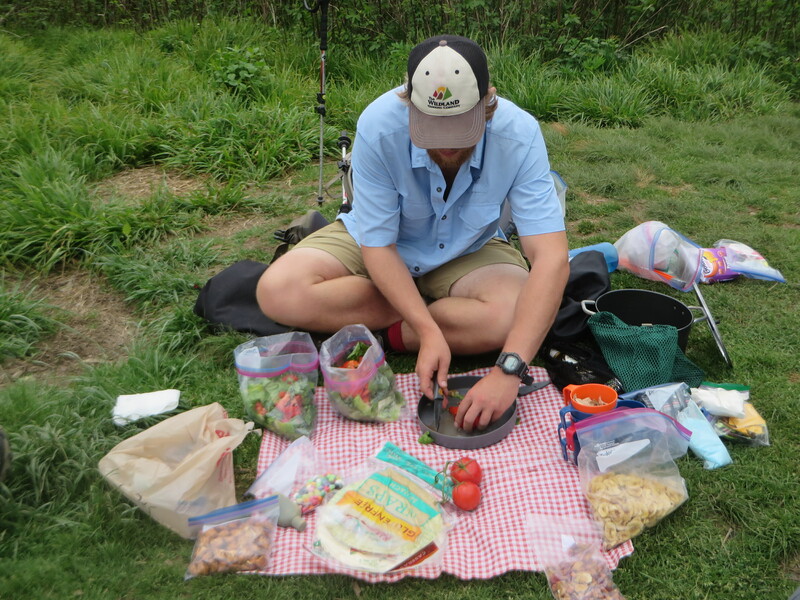 Ian proved to be a man of many talents, and outdoor cooking skills was definitely one of them! In addition, he was very knowledgeable about the region, never hesitating to provide us with information about the flora, fauna, geology and history of the Smokies. It was obvious he had a deep connection with the landscape, and a love of the outdoors that he wanted to share with others. Hiking in a small group provides you with the opportunity to get to know your companions well and a sense of camaraderie develops in a short time. Wildland Trekking attracts kindred spirits, who are active adventure seekers, enjoy nature and are generally curious about the world around them. Each participant adds something to the group with his/her individual perspective and knowledge base. And as you hike, there’s plenty of time to exchange life stories, allowing connections to be made with people who were mere strangers a short time ago. Wildland Trekking Company offers a variety of guided hiking adventures in North America and around the world. For more information: www.wildlandtrekking.com. Deborah Stone is a travel and lifestyle writer, who explores the globe in search of unique destinations and experiences to share with her readers. She works in collaboration with tourism boards, CVBs, public relations agencies, properties and lodging associations, as well as with tour companies and cruise lines in pursuit of her discoveries. She’s an avid adventurer who welcomes new opportunities to increase awareness and enthusiasm for travel.